Of the total 50 establishments that responded to the survey, 15 (30%) were between 10 - 19 and 14 (28%) were 20 - 29 years of age. A substantial percentage (46%) of establishments employed less than 10 persons while 18% employed between 10 - 19 persons. Overall, the survey results show that two-fifths (42%) of the establishments were engaged in manufacture of all other metal products and 26% in metal building materials. Most of the responding establishments (92%) in the Assembly-type and related industries were local and privately owned; 8% of manufacturers of building materials and one (50%) of the two producers of metal containers were wholly owned by a foreign corporation. Approximately, two-thirds (64%) of the establishments overall, and 50% and more by various sub-sectors reported no change in employment between 2011 and 2012. The majority of establishments (74%) employed no engineers. However, one-third (33%) of the establishments in each of the manufacture of metal furniture and electrical/electronic items employed seven and eight engineers respectively. Sales in the Assembly-type and related industries ranged from less than $1m to over $20m in 2012. One-third (34%) of the establishments reported sales of less than $1m while 28% recorded sales between $1m -$5m in 2012. Approximately one-fifth (18%) of the establishments indicated that sales were over $20m. By industry, the data reveal that a substantial percentage of establishments in boat building and ship repair (67%), assembly of appliances (50%) and production of all other metal products (43%) generated less than $1m in sales revenue. However, a half of the establishments in assembly of appliances (50%) and manufacture of metal containers (50%) recorded sales in excess of $20m as did a third of the establishments in assembly or manufacture of electrical/electronic items (33%) and metal building materials (31%). Over a third (36%) of the respondents, especially those in production of metal furniture (67%), experienced a growth in sales between 2011 and 2012 while a similar percentage (36%) recorded decreases and 28% indicated no change in sales. Over a half (54%) of the establishments in the Assembly-type and related industries sub-sector exported in 2012. Of the 27 establishments that exported in 2012, 48% exported less than $1m while 26% exported between $1m - $5m, 15% between $6m - $10m and 7% between $11m - $50m. Establishments in the production of metal building materials (25%) reported exports valued between $11m - $50m. A substantial percentage (48%) of the respondents showed declines in export sales over the period, 2011 - 2012 while 22% registered increases and 30% experienced no change. The establishments in electrical/electronic items and boat building and ship repairs together with the vast majority in metal building materials (75%) reported decreases in export sales between 2011 and 2012. Three-quarters (74%) of the establishments that exported reported exports of between 1-25% of total sales and 22% indicated exports to total revenue in the range of 26-50% in 2012. By sub-sectors, the data reveal that a half or more of the establishments in all sub-sectors except boat building and ship repairs recorded exports of between 1-25% of total sales. In addition, both respondents (100%) in boat building and ship repairs reported exports to total sales in the range of 26-50% and only one (13%) establishment in manufacture of metal building materials indicated exports to total sales of over 50%. The percentage of establishments in the Assembly-type and related industries sub-sector engaged in diffusion was not significant as revealed by the indicators of licensing, sub-contracting and outsourcing. Overall, 6% of establishments had licensing contract for product or process technology, one-fifth (20%) stated that they were sub-contracting and 12% were outsourcing. Two-fifths (40%) of the establishments purchased new machinery and equipment during the period 2011 - 2012. Both producers (100%) of metal containers purchased new machinery and equipment followed by manufacture of all other metal products (48%) and metal building materials (39%). Of the 20 establishments that purchased new machinery and equipment, 45% acquired such capital goods from foreign markets, one-quarter (25%) from local suppliers and 30% from both local and foreign markets. In terms of organisational innovation a relatively large percentage of respondents had introduced/improved maintenance routines and systems (44%) and introduced/expanded in-house training programme (40%). Approximately a third of the establishments had introduced/improved quality assurance systems (36%), introduced changes in management systems and techniques (34%) and introduced/improved waste management procedures (34%). In addition, over a quarter of the respondents had improved plant layout (28%) and 26% implemented major changes in organisational strategy and structure. Marketing innovation included the implementation of marketing methods and the development of new markets at home and abroad. Overall, most establishments from the Assembly-type and related industries were not engaged in these innovative activities during 2011 - 2012. Twenty-eight percent (28%) of the establishments introduced new marketing techniques, while 8% and 14% developed new markets at home and abroad respectively. A substantial percentage of respondents rated improving customer satisfaction (48%), product quality (42%) and productivity (38%) as very important reasons for innovating. Reducing production costs (40%) and improving working conditions (32%) were also identified as important. The lowest rating was assigned to dealing with new competitors in exports, in that 22% of the respondents indicated that it was not important. 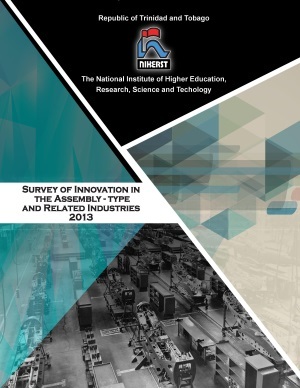 In the Assembly-type and related industries, the main obstacle to innovation was identified as the high cost of the innovation project, which a quarter (24%) of the respondents stated to be very significant. Approximately one-fifth of the respondents rated domestic economic conditions (20%), lack of financing (18%), lack of skilled/qualified personnel (18%) and weak customer demand (18%) also as very significant obstacles to innovation. A half or more of the respondents indicated that long administrative/approval process within the firm (54%), lack of information on technology itself (52%), lack of external technical support (52%) and legislation (50%) were not relevant/appropriate. The majority of respondents identified their establishments (56%) and customers (46%) as very important sources of information for innovation. A substantial percentage of respondents did not use parent firms (52%), client firms (42%), professional journals and trade publications (42%), education and research institutes (42%), government or public research institutes (40%), consultancy firms (36%), and fairs, exhibitions and conferences (32%) as sources of information on innovation. Customers (40%) were identified as the major source of information on product innovation followed by suppliers (24%) and their establishments (20%). In addition, establishments (38%) and suppliers (22%) were seen as the main sources of information on process innovation. With respect to marketing innovation, one-fifth of the respondents used their establishments (22%) and business and industry associations (20%). A quarter (26%) of the respondents accessed information on management innovation within their establishments. In general, most establishments in the industry were not engaged in co-operative and collaborative arrangements as a means of diffusion. One-fifth of the establishments had co-operative and collaborative arrangements with customers (20%) and suppliers (18%) while a similar percentage (18%) cited accessing new markets as the reason for collaboration. A substantial percentage of respondents indicated that innovation resulted in increased productivity (46%), competitiveness (38%) and service quality (38%). A quarter or more of the respondents recorded increases in product differentiation (36%), cash flow (30%), compliance with regulations (30%), profitability (28%), positive environmental impact (28%) and market share (24%). A relatively large proportion of respondents experienced no change in employment (38%), export growth (28%) and positive environmental impact (28%). The survey reveals that only 10% had undertaken research and development activities. Two (4%) establishments utilised trademarks to protect intellectual property. The majority (92%) of respondents, including all sub-sectors, utilised the Internet mainly for email (92%) and searches on the World Wide Web (82%). A half (54%) of the respondents used the Internet for advertising through a home page and two-fifths (40%) for e-commerce. Government support programmes for innovation, found inapplicable by 30%, were not accessed by any of the responding establishments of the sub-sectors. The results of the survey should provide insights into the innovation process and assist decision makers in developing policies to create the environment and incentives to catalyse innovation in the industry.